We all like to visit beautiful buildings and appreciate their ornamental façades without visual interruptions. But we also acknowledge the benefits of solar panels which, although unsightly, can provide renewable energy. How can we combine these two? Easy: using epoxy. In historical centres it is often complicated to install solar photovoltaic roofs due to their visual impact. Unless they are invisible! Giovanni Quagliato had this in mind when he started working within Dyaqua, his small family-owned company in Italy, to develop “Invisible Solar”. Giovanni was familiar with epoxy resins, as he used them in his artwork, and he soon realised how they could provide a totally natural look to polymeric compounds while keeping them transparent to light. With this logic, he then decided to use them in the creation of a compound that, depending on the density, could vary to look like any building material – terracotta, stone, concrete, wood… – without fearing atmospheric agents or chemical solvents. “It’s all about density: it has to be enough to fool the eye, but not too much, so as not to block the rays of the sun,” explained Giovanni. For the moment, the invisible solar panels are not financially sustainable, because they require an exorbitant amount of manual work. Only a careful human hand can be gentle enough to apply different layers of resin at varying densities, both above and under the photovoltaic cells, with the right curvature for the perfect roof tile. But Giovanni is optimistic and hopes that one day we will be able to invent machines that integrate or replace this manual work, so that mass production is possible, and competitive. 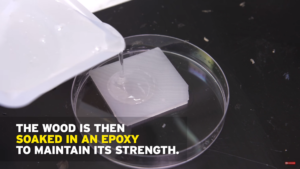 But solar panels are not the only innovative application where epoxies can showcase their super powers. Material scientists at the University of Maryland have discovered a way to make wood transparent. The process, well explained in this video, is simple and the result is a material which is very similar to glass but more resistant and biodegradable. If developed correctly, the possibilities of these two discoveries are endless. 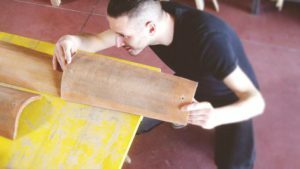 Invisible materials are an exciting solution to overcome the aesthetic problems of using new technologies in sensitive locations. We may not see them but they can definitely make a noticeable impact. Read the full stories in Impact Journalism Day and Radio Cable (Translation provided by Google Translate).